Luxury glamping on Skye, discovering beautiful scenery, great food and starry night skies. I’ve visited, or passed through Skye a number of times over the years, but it hasn’t been a lack of free time that’s stopped me from writing about it on this blog so far. You see, I’m still very much learning to love Skye, and see it as others do. It’s not just me, as Mr G’s feelings mirror my own. So, would a spot of luxury glamping on Skye change my mind? Earlier in the year my heart slowly began to thaw towards Skye. The thaw started in February, when we left the Mainland one rainy morning in search of good weather. It’s not often you’ll hear of anyone heading to Skye for good weather, but on that day luck was on our side and we shook off the rain. We enjoyed a hike up to the Old Man of Storr, and for the first time I fully appreciated the rugged beauty of the landscape. I’d visited this spot before, so was I beginning to see Skye differently? That afternoon we had lunch in Cafe Relish in Portree. The homemade soup and sandwiches we had were fab, and the staff couldn’t have been friendlier. It was nice to leave with a good memory of Portree, as the town had always symbolised everything that I disliked about the island. A few years ago we spent our worst weekend break ever there. Our accommodation was substandard and grubby, the customer was never right and one member of staff openly tore strips off another in a bar packed full of customers. It was like something out of the British TV comedy ‘The League of Gentlemen’ – I half expected to find Tubbs and Edward serving behind the bar. Fast forward to September and we’re back on Skye. This time to spend a night in Uig before catching the morning ferry to North Uist. I’m going to share that Skye trip with you today – but first a couple of stops en-route. You’ll have realised by now that we flit around like butterflies, landing at a place, staying a while then flitting off on a never-ending quest to leave no stone in Scotland unturned. We left Edinburgh, driving north through heavy rain and dark skies. I started to doubt the dry forecast the weatherman had given for Skye that day. Normally we stop at Spean Bridge to visit the Commando Memorial which was erected in 1952 to commemorate the elite fighters who once trained in the area. This time we made a quick pit stop for coffee and cake. On through Kintail we drove with Mr G ranting that there was no need for people to drive at 20-mph just because it was raining. As we approached Eilean Donan the sky began to brighten. We stopped at the castle for a leg stretch, and also because we can never pass without photographing it. It was busy, and to say the boy went down a storm would be an understatement. 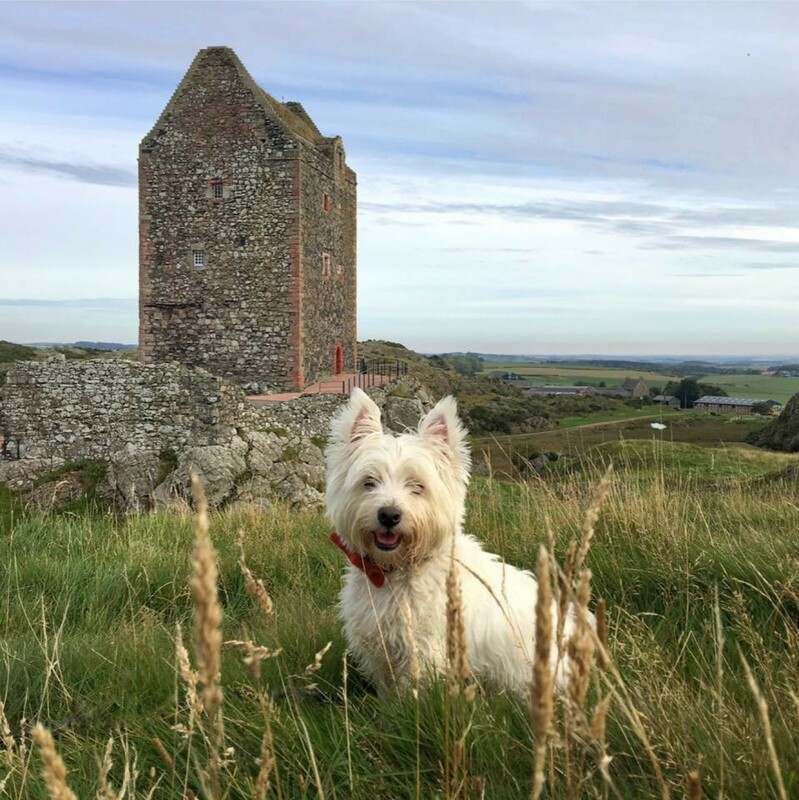 People were drawn to the wee Scottish dug beside the iconic castle like moths to a flame. At one stage he looked like a celebrity with a press pack surrounding him. Accustomed to the attention he took it all in his stride. We met a lovely couple from Canada who were also Westie parents, so we lingered a while chatting and singing the praises of our much-loved wee white beasties. It’d been several years since our last visit to the pretty village of Plockton, so before crossing the bridge to Skye we decided to visit for lunch. The grey skies of earlier had turned bright blue – it was definitely an al fresco lunch type of afternoon. Sitting outside the Plockton Hotel it felt like summer (only summer 2017 never arrived in Scotland). Being sun starved Scots, it was wonderful to bask in the sun’s rays once more. I broke with my usual lunchtime tradition of soup and sandwiches and opted for a tasty Talisker Whisky pate instead. The Wee White Dug definitely approved – his saddest of sad eyes scored him a few pieces of lean ham hock from my pate. Mr G played it safe with a fish soup and sarnie combo. Lunch was washed down with a can of fizzy juice each. Now, if you’re not a Scot you’ll probably be scratching your head wondering what on Earth fizzy juice is, so let me enlighten you. Fizz juice is Coke, Pepsi, Fanta etc and here in Scotland – Irn-bru (which is made in Scotland from girders)! Our enjoyment of lunch, and the unexpected sunshine was interrupted by the demon of outdoor dining – a persistent wasp. While I’m not afraid of them, the aggressive buzzing followed by swiping leaves me exasperated. Arms flailing like a woman possessed I noticed the wooden spoon with our table number on it and picked it up. Bzzzzz, bzzzzz, bzzzzz – BAT! The wasp jettisoned out of the beer garden faster than a fighter jet. 5 minutes later it was back for more. Bzzzzz, bzzzzz, bzzzzz – WHAM. Off it hurtled at what must have felt like G-Force. Mr G wanted in on some wasp baseball action. A quick lesson in technique later and he was hitting them out of the beer garden like a pro. Who knew you could have so much fun in the company of wasps?! (Please note that this game is not suitable for bees. Bees are good guys). After lunch we enjoyed a walk around the village, soaking up the sun. Plockton sits in a sheltered bay on Loch Carron. Protected from wind, the village has a mild climate which has allowed palm trees to flourish. Despite the palm trees the village looks typically Scottish so there’s no mistaking where it is. Sun still shining, we crossed the Skye Bridge to the not so ‘Misty Isle’ and headed towards Uig and the Fairy Glen. The Fairy Glen is a popular tourist attraction on Skye, and on a beautiful, blue sky day its easy to see why it attracts so many visitors. While I find the equally popular Fairy Pools at Glen Brittle decidedly underwhelming, the same can’t be said for the Fairy Glen – I love it. We parked the car and followed the single track road up into the glen, sheep eyeing us suspiciously as we passed. On either side of the road weird, conical mounds rose into the air. The magical, otherworldly looking landscape of the Fairy Glen was created by a series of landslides. By the time we caught a glimpse of the prominent rocky outcrop known as Castle Ewen we were melting under the warm September sun. We stopped to let the boy cool off a little. Sufficiently rested, and after a refreshing drink of water he was now ready to scramble up and down fairy hills in the glen. We followed the narrow path which leads to the summit of Castle Ewen. The view of the glen from the path was beautiful and we stood looking down on the ant-like people below. In the distance a piper began to play, and the sound of bagpipes floating across the glen added to the magical feel of the place. As I stood listened to the piper playing, a man began wheezing his way uphill behind me – his Darth Vadar like breathing shattering the magic of the moment. Mr G’s obsession with high points you can plummet from led him to stay on top of Castle Ewen far longer than was necessary. At one stage I though he might plant a flag on the summit and rename it Castle Grant! The boy and I made our way back down to ground level and played a game of ‘where’s Dad?’ as Mr G waved furiously from his vantage point. Soon tired of waving the pair of us went off to find a vantage point of our own. Spotting us, was all it took to get Mr G down. Worried he was missing out on a better viewpoint, he hurried to join us. We wandered a while longer, but we both had a drooth on (Scots for thirst) and it definitely felt like wine o’clock, so we left to check-in to our accommodation. Our home for the night was a dog friendly glamping pod at The Cowshed – a boutique bunkhouse on a hillside overlooking Uig Bay. Our pod was like Dr Who’s tardis – tiny on the outside but deceptively roomy inside. It had a comfy sofa, a dining table and chairs, a double bed, a compact kitchen area with fridge, sink and microwave oven plus a WC which also doubled as a shower room. There was under-floor heating too just in case it got chilly through the night. We were absolutely delighted with our choice of accommodation. The boy checked out his mini dog pod with interest (and no, he didn’t sleep in it – he’s far too much of a mummy’s boy to sleep on his own). Before dinner we sat on the decking enjoying a drink. It was wine o’clock and the sun was shining – bliss. It was so nice sitting there admiring the view, chilled glass of wine in hand and my two favourite boys by my side. That evening we enjoyed a tasty dinner in the sunny conservatory of the Uig Hotel, which was a short walk from our accommodation. The boy snoozed under our table, plum tuckered after his fun day out. Despite it being late in the season the hotel was busy, giving it a lively vibe. After dinner we decided to pop down to the The Ferry Inn for a nightcap. They’re Twitter buddies of mine and fellow Westie owners too. The last time we were in The Ferry Inn it was old-fashioned and in dire need of renovation. Now under new ownership it’s been given a tasteful, modern facelift. It’s welcoming and cosy and that’s probably why we found it so difficult to leave. Our nightcap turned into three nightcaps – I acquainted myself with a smoky single malt from Talisker (when in Rome), while Mr G sampled a few gins from the inn’s impressive selection. We spent a lovely evening listening to music and chatting. Sadly the boy didn’t get to meet resident Westie Archie as he was tucked up in bed fast asleep and it seemed a shame to waken him. We finally managed to tear ourselves away, saying goodbye and promising to return. It was pitch dark outside so we switched on our iPhone torches to light the way. As we were walking Mr G looked up and remarked “look at the stars” – he quickly regretted opening his mouth. I looked up and was completely wowed by what I saw. Above me was the brightest, most star filled sky I have ever seen. Even with my shortsighted eyes I could clearly pick out the Milky Way. I went into hyper, wax-lyrical mode, like I’d never seen stars before. Progress was slow after that. My efforts to walk uphill were hampered by me constantly stopping to look up, oohing and aahing as I went. By the time we got back to our pod Mr G was exasperated and sick to death of hearing about the night sky. Before bed I stood on the decking a while, gazing skywards. It’s a night I’ll never forget, and it made the perfect end to a perfect day. The next morning we packed and reluctantly left our wonderful wee pod and Uig behind. We vowed to return and stay longer next time. We’d enjoyed every second we spent glamping on Skye – had we just learned to love Skye? If you enjoyed this post you can read about another of our glamping adventures here. Hello – I just found you. What a wonderful blog! Your site seems to be the perfect example of the maxim that people don’t read blogs, they follow bloggers. Of course, now I want to follow you and your Wee White Dug. Thanks for the inspiration! By the way, the last time I visited Skye (2009) the island was blanketed by “wee Scottish mist” and fog that was thick enough to provide the ideal background for a Steven King novel. Like you, I had a hard time understanding all the folks who rave about it’s beauty. We’ll be returning in 2018 & I’m hoping she will show her happy face. Did you enjoy the Talisker? Yet another great read – with lovely accompanying photographs; thank you so much! I loved them all with favourites showing a) Caspar straining every fibre of his being trying to look for a Mr. G in the ‘Where’s Dad?’ search, b) Caspar patiently posing for the paparazzi c) The Fairy Glen – and d) – my favourite – The Wee White Dug sniffing the autumnal air from the indoor warmth of the open-doored clamping pod; an absolute study of cuteness! When I think of my time on Skye – as a teenager – my prime memory isn’t the dank, wet misty day we experienced during that summer holiday: instead it is the comforting and warming fish soup – Cullen Skink – I was introduced to at The Stein Inn. It was so good that I sought out the recipe and include it in all Burns Night supper menus. The taste – unlike the weather at the time – always conjures up Blue Skye thinking!! Aww amazing memory thanks for sharing and glad the blog brought back happy memories for you. I just adore the photos by Eilean Donan!! I’ve STILL never visited Skye, and it’s getting to the point where I’m worried I’ll be disappointed when I eventually do go, lol. Some of those views are just incredible though! I also LOVE your pod, and the dog pod is so cute! Marvelous! Incredible. Skye is incredible, and so are your photos and your narrative. I have only one question…how did you manage to hit Skye with no rain and sun much sun? Well done! I can’t imagine not loving Skye! Glad you had a change of heart. It might be my favorite part of Scotland. We stayed a week. We stayed away from Portree, except when necessary. The Quiraing, Neist Point, the Fairy Glen, Dunvegan Garden, Kilt Rock, and Mealt Falls, Kylerhea Otterhide – so many incredibly beautiful landscapes. And so many more things we didn’t have time to see. We stayed in a slanted old cottage partly out and partly in Storr Loch, and loved it. Sitting in the armchair by the window of the sitting room, we looked straight out to The Old Man Of Storr. It was perfect. Wish we didn’t live across an ocean and we would go back regularly! Your holiday home sounds wonderful. I’ll never like Portree and will always avoid it where possible but I’m glad I’ve warmed to the island. It’ll never be my favourite place in Scotland but it’s somewhere I’ll definitely visit from time to time.! What a difference some sunshine makes! I’ve had more wet days there than any other island and I too am not a fan. It is probably my least favourite of all the islands. It does look beautiful and appealing in your photos though. Me too – sometimes I’ve barely been able to see to the end of my nose through rain and mist. The place is much cheerier and more enjoyable when the sun shines. I’ve always liked Uig though as on the whole it’s well away from the crazy crowds. Definitely not my favourite island but many of the others have the things that I love most, stunning beaches and heaps of history. I think if mountains are your main passion then Skye is perfect. Another delightful virtual trip and good laugh! I love what a great little tourist photo model Casper is. He is so darn cute! As a sucky Westie Mom, I was relieved that he didn’t have to sleep outside alone! It was nice to see Skye sunny, as it was totally pouring when we were there! I’d never leave my darling boy outside. I wouldn’t be able to sleep a wink for worrying about him. 😂 we were so lucky with the weather. It’s a different place altogether in sunshine. Last time I was on Skye was August of ’81. Was 94°F and crowded. We detoured to Raasay (backpackers) and had a wonderful time. But now your post makes me want to go back! I’m glad you had such a wonderful experience there. I had a magical time in Skye this year and all your photos and adventures just make me want to return!! Thanks for sharing! A lovely read and those matching pods are amazing! Hahaha, I have the same problem with my Dude, he too always wants to climb as high as he can. What is it with these boys? The matching doggy pod is super cute. I’ve no idea – don’t get me wrong I love a good view but there’s a limit to how long I want to savour it! The pods were amazing and the wee dog pod such a cool touch.